It often amazes me how much time I spend dreaming about and researching the places I want to visit when we travel. I have a clear vision of the two of us of walking down tiny off-the-beaten-path streets in towns and villages all over the world. They all seem so interesting, unusual, and well… just more darned fun than my own home town. I know it’s human nature to think the “grass is greener” in someone else’s field, but lately I’ve been ignoring the town I have professed to love. Heck, I chose to move here not once, but twice. That must mean something. Since we are doing more local travel these days to save for our adventure in Spain, I thought it would be a good time to explore Portland once again and share some of my finds. Truth be told, I’m also hoping to entice a home exchange or two. And what better way than to share our own local adventures. We’re training for our big walk on the Camino de Santiago and have covered so many miles and made so many interesting discoveries that I’ve joked about starting my own on foot tour company. Not exactly the shuffle, eat, shuffle, eat tour I’m going to tell you about in this post, but a more robust 5 or 6 mile tour with a stop for lunch or a glass of wine and a nibble. Kind of a walking workout, sight-seeing and food experience combined. It is amazing what you see when you travel at about 3 mph. You have time to take photos and you burn enough calories to alleviate any guilt about the eating and drinking. I think I’m on to something. Hubs thinks I’m crazy. Maybe. 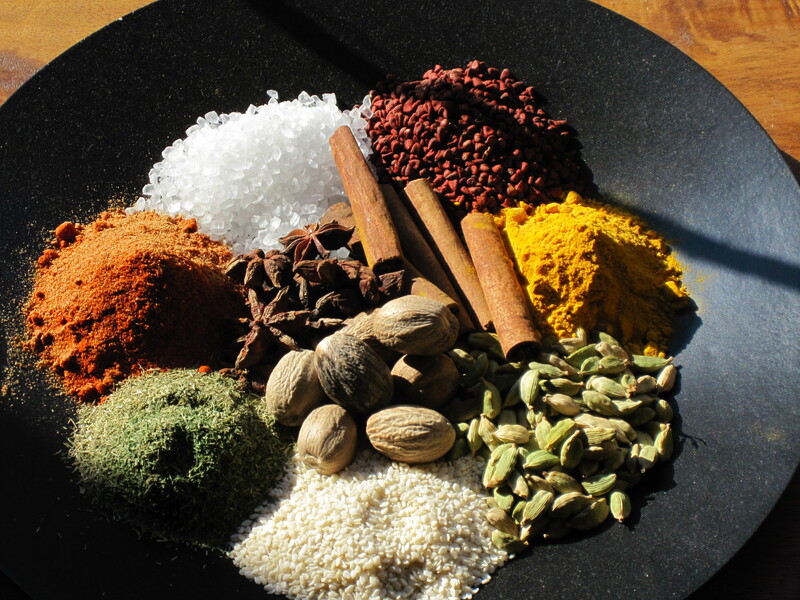 Since Portland has become the go-to destination for foodie culture, and since we love to eat, an Epicurean Excursion offered by Portland Walking Tours seemed like a match made in heaven. And it was. Three hours flew by as we enjoyed downtown Portland’s culinary scene, enjoying the smells, sampling the tastes and sipping some tasty wine along the way. Our starting point was the Heathman Hotel where we all gathered on the mezzanine to meet our tour guide. There were about 10 of us in the group, locals and out-of-towners, all ready for fun and food. We stopped at ten locations – specialty stores, restaurants, a wine bar, and a cupcake shop, where we learned about finishing salts, tasted olive oils and vinegars, enjoyed a back of the house kitchen tour and met with several of local chefs. Our little band of food explorers meandered through Southwest Portland and into the Pearl District. An easy mile and a half walk during which time our guide kept up a running and very informative conversation offering tidbits of Portland history, architecture, farm and food facts and a joke or three. He was a wealth of local knowledge. A tour guide by day and an improv comedian by night. At each stop we learned about the farm to table food culture that is alive and well in Portland and enjoyed a sample or two. Some larger and some rather tiny, but all delicious. Add in two glasses of wine and several mini cupcakes and we ended our afternoon feeling well-fed, well-informed and very well-entertained. Taking a tour in your own town is a great way to re-kindle the romance with your city. You’ll learn things only tourists the take time to find out and enjoy a fun afternoon with your sweetie, your kids or your visiting dignitaries. 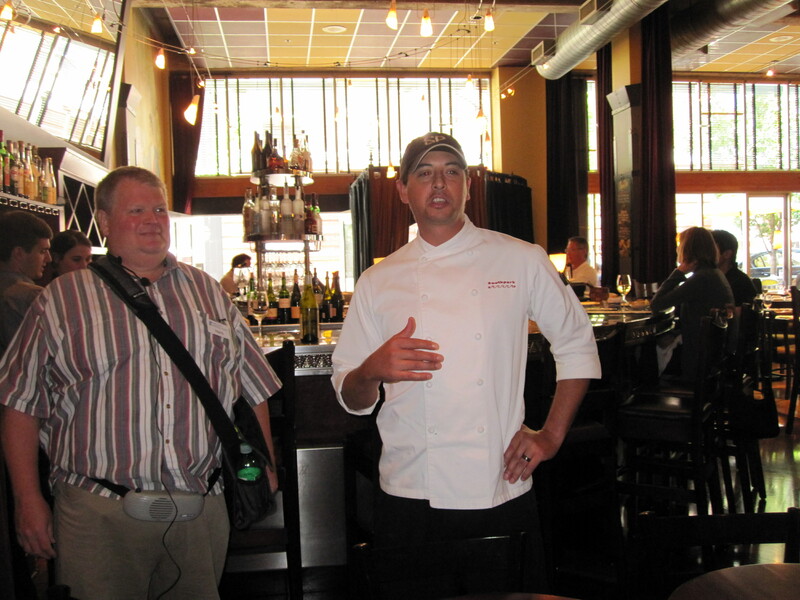 There are two companies in Portland currently doing food tours. 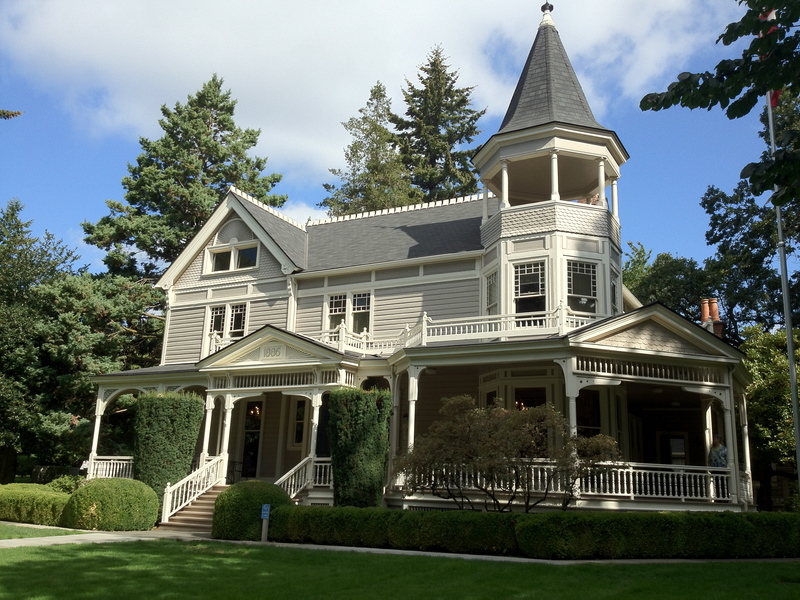 Portland Walking Tours and Forktown Food Tours. 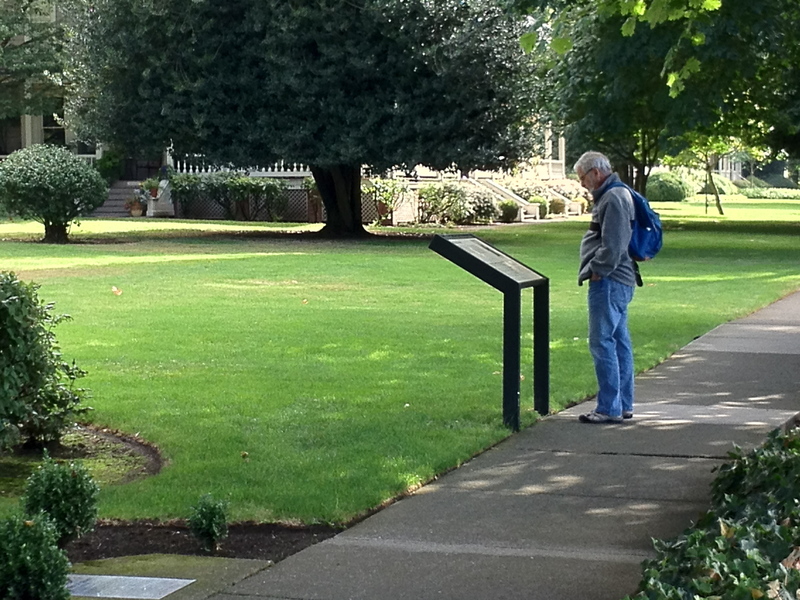 We signed up with Portland Walking Tours. The cost was $59 each, so it’s not cheap, but it was a lot of fun and we will do it again. Next up, since Portland has become the food cart capital of the world, I think we might sign up with Forktown for their Food Cart Tour. Portland has so much to offer. It’s a vibrant city filled with art, culture, history, natural beauty, wonderful quirky people, and food, fabulous food. Oh, and artisan coffee shops, wineries, brewpubs and the hubbie’s new fav – micro-distilleries. Now there’s a tour he’d really enjoy! Since we are now fully committed to the Camino de Santiago trek next September, the hubs and I have upped our walking game significantly. Every weekend we’re out exploring the city streets and country roads in and around Portland. It is amazing what you miss when you are whizzing along at 55 mph. Of course, the beautiful Fall weather hasn’t hurt. I don’t know how motivated we’ll be when it’s cold, gray and soggy, but we’ll cross that bridge (on foot) when we come to it. I’m in charge of mapping our routes and coming up with interesting locations and access to restrooms and good food along the way. So far, so good. 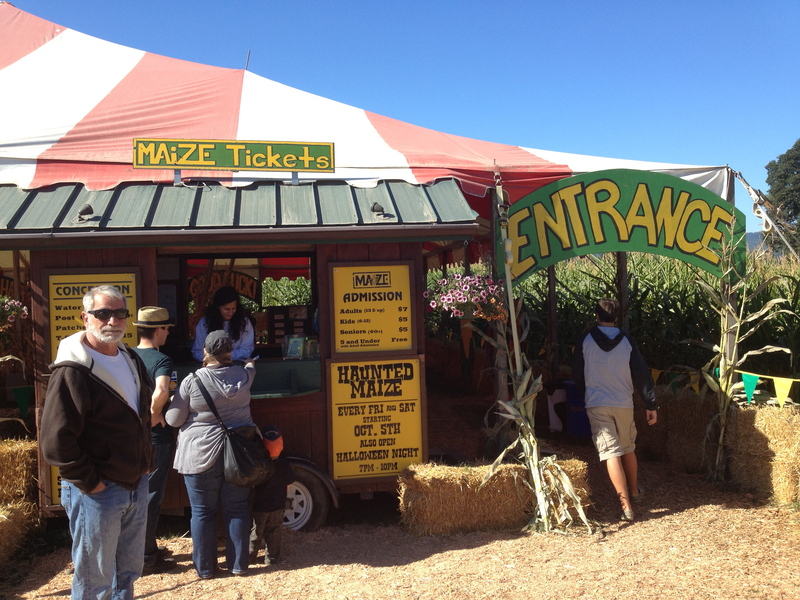 Last week a friend of mine who is always off on one adventure or another, mentioned she had gone to the Portlandia Corn Maize out on Sauvie Island. When I asked how much actual walking was involved, she indicated it could be A LOT depending on how many dead ends you took in the maize. Well, thanks to Lois, I thought this would be a great way to try something new and get our walk on at the same time. What a hoot! Yes, it is mostly for families with kids and somehow that brought out the kid in us too. We walked, we laughed, and we got lost over and over again. 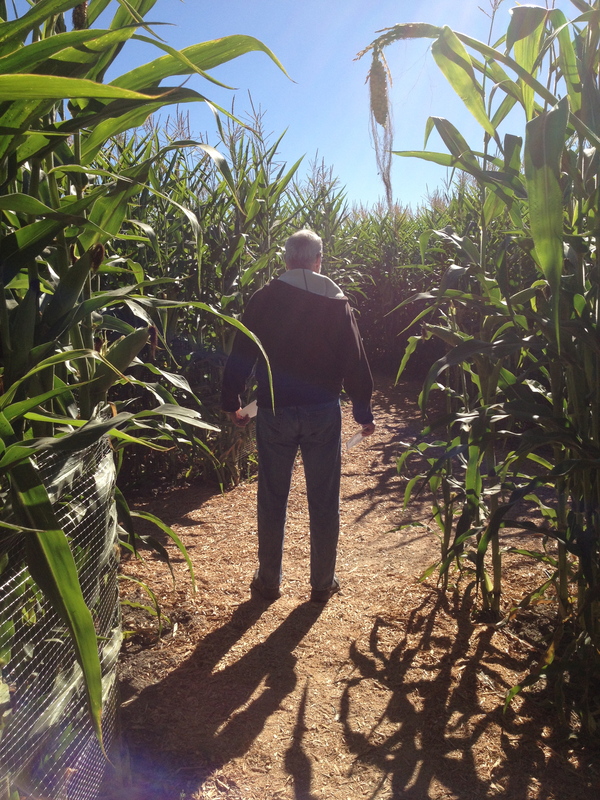 But, we enjoyed the fresh air, acres of corn stocks at least ten feet tall, answered silly questions that helped us find our way through the maize, and of course, I sang a chorus or two of “I’m as Corny as Kansas in August”. Honey, I think we’ve been down this row before. 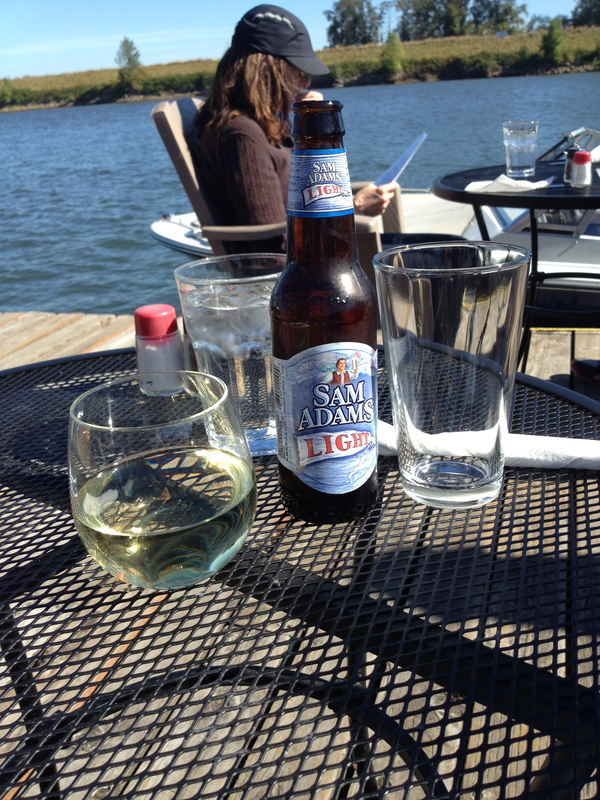 And, the best part…because we aren’t kids (only kids at heart), we finished the afternoon with a couple of adult beverages on the dock and watched the boats go by. In all my travels, I have one no fail rule. When the rest of the country is taking to the highways for a three day holiday – that’s the perfect time for me to stay at home. I’m not a lover of crowds, or traffic for that matter, so joining millions of people fighting for a camping space or a hotel room at the beach, or sitting bumper to bumper on the interstate…not my cup of tea. I’m probably missing out on something, but so be it. What I really wanted to do this weekend was take advantage of these last few gorgeous late summer days. I know that any week now, it will start raining in Portland and it won’t stop until sometime in 2013 – say around June. So, when Saturday morning brought us a beautiful sunny day, cloudless blue skies, and the masses out of town, we had the perfect opportunity for an in town adventure. Hubs and I headed over the bridge and across the river into Washington State to explore the City of Vancouver (The ‘Couve) on foot. Urban walking is my new thing since I bought the book “Walk There! 50 treks in and around Portland and Vancouver”. My goal is to do all 50 at least once. I’m up to four, but I only bought the book a few weeks ago so I’m feeling pretty good. Today’s route had lots of historical points of interest. Our walk was a 6+ mile loop that started at Fort Vancouver. We walked by the beautifully restored homes on Officer’s Row where Hubs stopped to read every one of the historical markers. I bounced around trying to keep my heart rate up. Following the map, we wound our way over the Interstate and on into downtown Vancouver to Esther Short Park where the Saturday Farmers’ Market was in full swing. We’d worked up an appetite and homemade tamales were calling us, so we stopped for lunch. 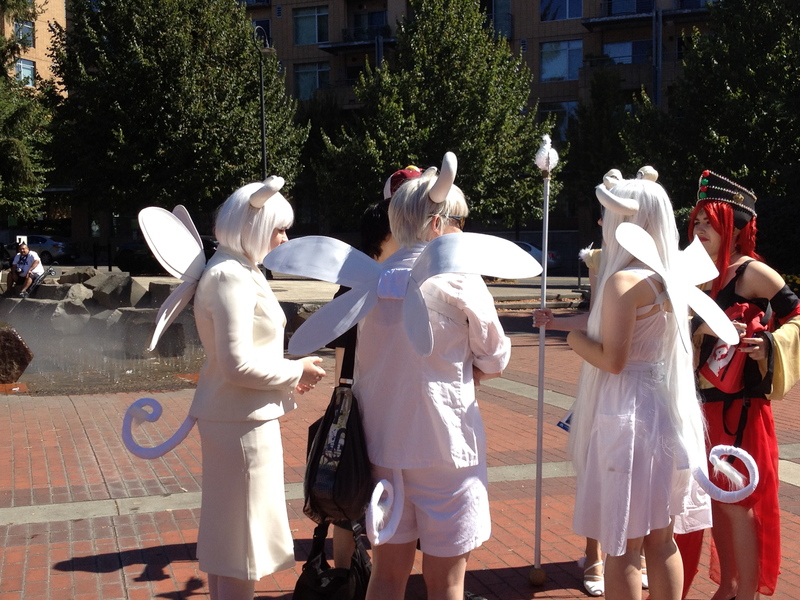 That’s when we stumbled into the middle of a Kumoricon convention. Thousands of young people in the streets and the park, each dressed as the character they have created for online fantasy role-playing games. (the simplified explanation that someone gave me). We had stumbled into the world of Animé and Mange, and it was absolutely one of those fabulous serendipitous moments that I love! We reluctantly left the revels in the park and headed down to the shores of the mighty Columbia River where our path followed the shoreline for a couple more miles before turning inland and back up the hill towards the barracks of Ft. Vancouver. We stopped to watch several small planes take off and land on a tiny air strip. That’s when we discovered the best surprise of the day. 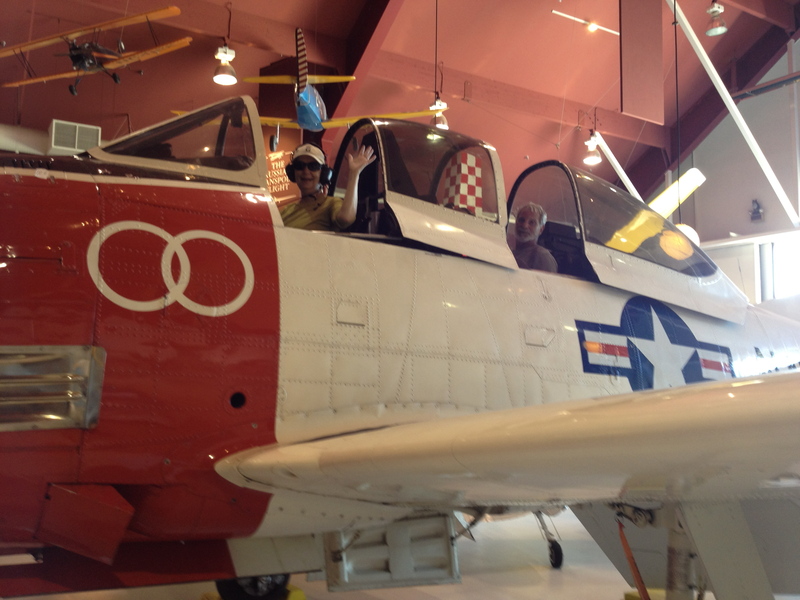 The Pearson Air Museum – two airplane hangers filled to the rafters (literally) with vintage planes, flight simulators, amazing old photographs, assorted gear… and Gordon, aviation buff extraordinaire. Gordon knew everything about these beauties and had stories to share. I chatted him up a bit and then went in with the big question (and a big smile to match). “Uh, Gordon, do you think my husband and I could sit up in that plane and you could take a quick picture of us?” “Sure, not a problem,” said my new best friend. He showed us how to climb into the plane and explained that this baby was a WWII era training plane. I put on the headphones and learned how to move the rudder and the flaps and all kinds of cool stuff. Thank you Gordon! We spent an hour at the museum, and a return visit is definitely in order so hubs can play on those flight simulators. Next, a short hike up the hill from the original Fort Vancouver. It was a Hudson Bay Trading Post in the early 1800’s. It’s now a National Monument filled with living history. We crossed the expansive parade grounds, stopping to look at each of the old wooden barrack buildings – home to thousands of troops until the 1950’s. If you stood still and closed your eyes, you could almost hear the footsteps of all those young men as they marched across the grass so many years ago. Sometimes you don’t have to travel to the other side of the globe or even the country for adventure. We had the backpack, but no rollies were required on our close to home sightseeing trek. Four hours on foot + $15.00 for lunch and a donation to the museum + warm sun on my face + time spent outdoors with my walking buddy and partner in crime = a perfect Labor Day Weekend getaway. And, we managed to get home in time for hubs to watch his favorite Saturday afternoon show, Trout TV.